Snapz, this unique and adorable stuffed alligator from the Zibbies collection, is ready to spark hours of imaginative play and adventure. 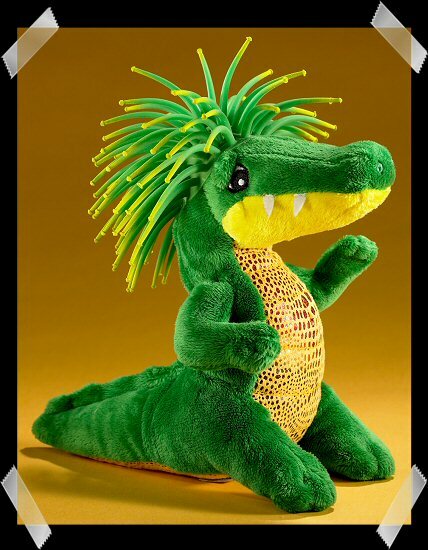 With soft green fur, yellow and brown "scaly" tummy, fun felt teeth, embroidered eyes, and a head full of super-silly Hyperflex hair, Zibbies plush alligator Snapz will delight alligator lovers everywhere, whether they love stuffed alligators or real ones. Zibbies are super silly stuffed animals with soft plush bodies and wild Hyperflex hair, a wonderful combination for hours of fabulously fun plush animal play and adventure! What is Hyperflex you ask? It is a stretchy material that expands to ten times its original size and returns back to its original form. What a wonderful hairdo it makes! Each Zibbie stuffed animal comes with a secret code to explore the kid-friendly Zibbie world online.